Over at Splitcoast today, the sketch challenge. This is such a great layout as there are so many different shapes that could be stamped on, or, as I’ve done today, showcasing some beautiful designer papers. This is made with a standard A2 card base. Next came a layer of designer paper, followed by a rectangle of solid paper layered with more designer paper. It was wrapped some seam binding that has been sponged with Stampin’ Up! River Rock and edged with a R59 Copic marker. The holly image has been stamped with Memento Tuxedo Black, colored with Copics and sponged around the edges. 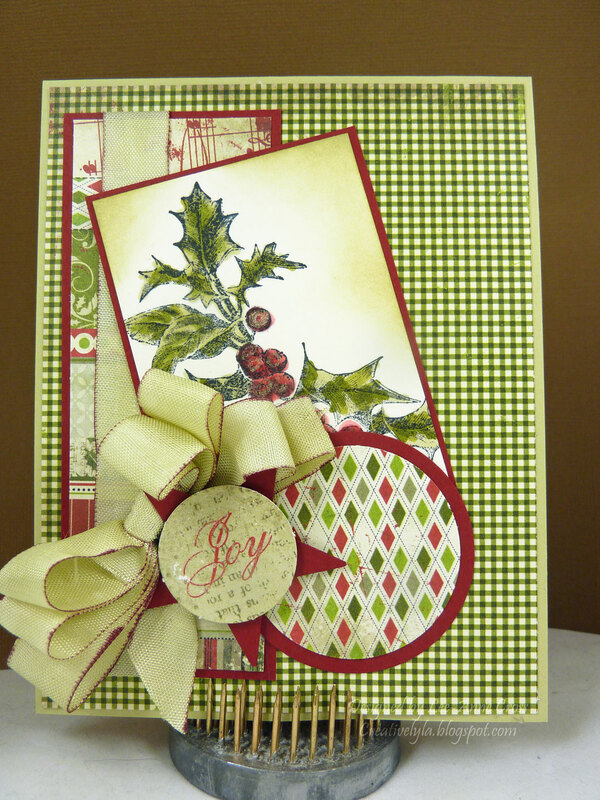 Then I added a little sparkle with a Sakura Stardust pen, just to the holly berries. Next comes some solid paper punched with a 2″ circle punch, with yet another coordinating paper layered over top. I added a bow with the same dyed seam binding. Then added a punched star in the solid color with a small tag from the same series of papers. I also traced the word “Joy” with the same Sakura Stardust pen.